Remember that first week of school after summer? Now, we will bet you a pile of towel animals that your English teacher's first homework assignment was an essay entitled "What I Did On My Summer Vacation". Are we right? Of course we are! Well, we invited our cruise podcasting friends to submit to us a short "audio essay" what they did this summer. The response was tremendous and fun! There are great stories, tips, ship reviews, food reviews, cruise ideas and so much more. It came out so well, we want to do this every year and expand upon it. Please let us know what you think about this episode. Email us at thecruisedudes@gmail.com or calls us at (424) 272-1916. It has been almost a month since we had recorded a podcast together. Summer was wrapping up and we both had a lot of things on our calendars, so we decided to take a break from our regular production schedule for a few weeks - but now we are back! We're calling this show a "Seaside Scuttle", we call it that because basically it's a show with no particular topic and we just talk about about random things that have to do with cruising, our lives, and what we have been doing and such. Sometimes we just have to do a show like this at times and we hope you enjoy getting a peek into our lives that sometimes doesn't involve a cruise. We are planning our show topics for the last quarter of 2016, along with our holiday show! Do you have a show topic or would like us to investigate a cruise subject in detail? Please email us your ideas at thecruisedudes@gmail.com. Episode #82 - Mini Show: Seven Things You Must Do In Santa Barbara! We are back - well, sort of back. Scott has been busy working in Big Bear, California and Tommy went to Walt Disney World in Florida for a few days to surprise a few of his Disney podcasting friends for a meet up and fun in the theme parks and eating, of course! Tommy has to go out of town for business this week, but we will be back together recording new shows for you starting next week. On this new show, we have a surprise for you! Tommy and his wife drove up this last weekend to Santa Barbara to meet Sheri from CruiseTipsTV for the first time! We had wonderful time with her and her mom over lunch, shopping along State Street, the beach and the wharf. It was a beautiful California day, perfect weather, sunny and warm. 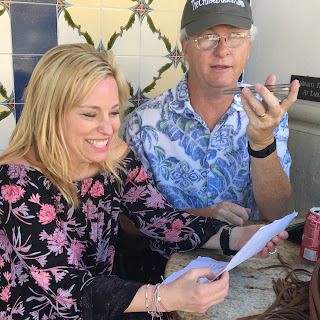 We took time this past weekend to record together for you a special mini show, Seven Things You Must Do in Santa Barbara on location, live, outside of a small coffee shop on State Street. It was a lot of fun and Sheri has some wonderful tips and secrets how you can have some great times, inexpensive things to see and do while visiting this amazing port stop on your next California Coastal cruise.